Napoleon’s campaigns were the most complex military undertakings in history before the nineteenth century. But the defining battles of Austerlitz, Borodino, and Waterloo changed more than the nature of warfare. Concepts of chance, contingency, and probability became permanent fixtures in the West’s understanding of how the world works. 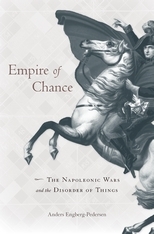 Empire of Chance examines anew the place of war in the history of Western thought, showing how the Napoleonic Wars inspired a new discourse on knowledge. Soldiers returning from the battlefields were forced to reconsider basic questions about what it is possible to know and how decisions are made in a fog of imperfect knowledge. Artists and intellectuals came to see war as embodying modernity itself. The theory of war espoused in Carl von Clausewitz’s classic treatise responded to contemporary developments in mathematics and philosophy, and the tools for solving military problems—maps, games, and simulations—became models for how to manage chance. On the other hand, the realist novels of Balzac, Stendhal, and Tolstoy questioned whether chance and contingency could ever be described or controlled. As Anders Engberg-Pedersen makes clear, after Napoleon the state of war no longer appeared exceptional but normative. It became a prism that revealed the underlying operative logic determining the way society is ordered and unfolds.